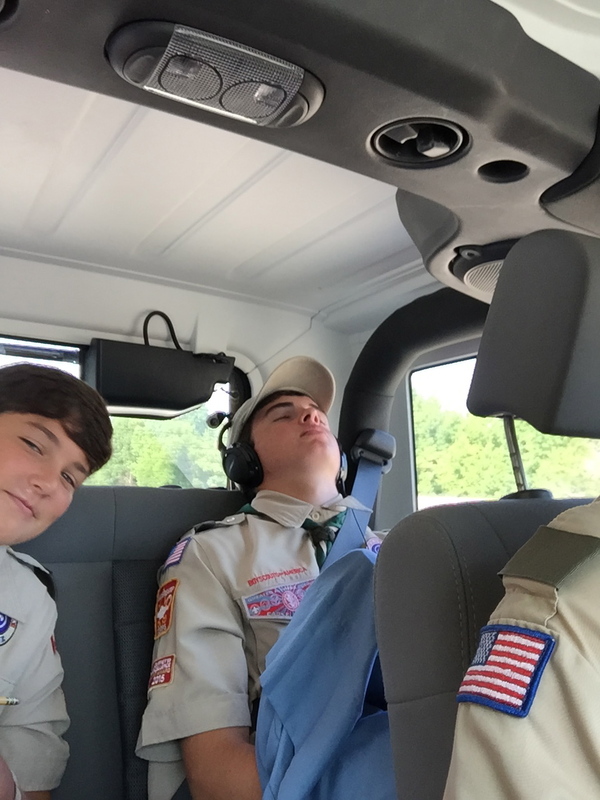 Troop 50 left for the beautiful mountains of Tennessee to spend the week at the Skymont Scout Reservation in Altamont, Tennessee. The morning started early with a 7:00 AM meeting time to load the trailer, say a prayer, and take some photos. After a brief maintenance break to air up the trailer tires, we were off and running. The scouts pose in the morning sun for a pre-camp photo. during the drive while his ASPL chilled out. The trip northward was uneventful except for a brief traffic slowdown around the Tennessee-Georgia border. After a lunch stop at the Tennessee Welcome Center, we were soon back on the road through Chattanooga and facing a steep grade up the mountain along I-24. We ascended easily, however, and arrived at Skymont by 2:00 PM. We met our troop guide, T.C., who quickly had us moving through camp to check in. We dropped off the medical forms for review before heading to our campsite, Quail Run (we have not seen any quail as yet). The troop trailer was waiting for us in the campsite courtesy of Mr. Saucer, who had hauled it in from Auburn. We changed into our swimsuits in preparation for the swim check but first made a stop at the dining hall for an orientation on how to eat. The food is served family style (except for tonight) and requires scouts to serve as KPs who set up the tables, bring out the food, and clean up afterwards. This is always good experience for use at home. Our next stop was to the waterfront for our shot at passing the BSA swim test. The test consists of swimming seventy-five yards using a forward stroke and twenty-five yards of backstroke. Then you must demonstrate that you can float on your back. 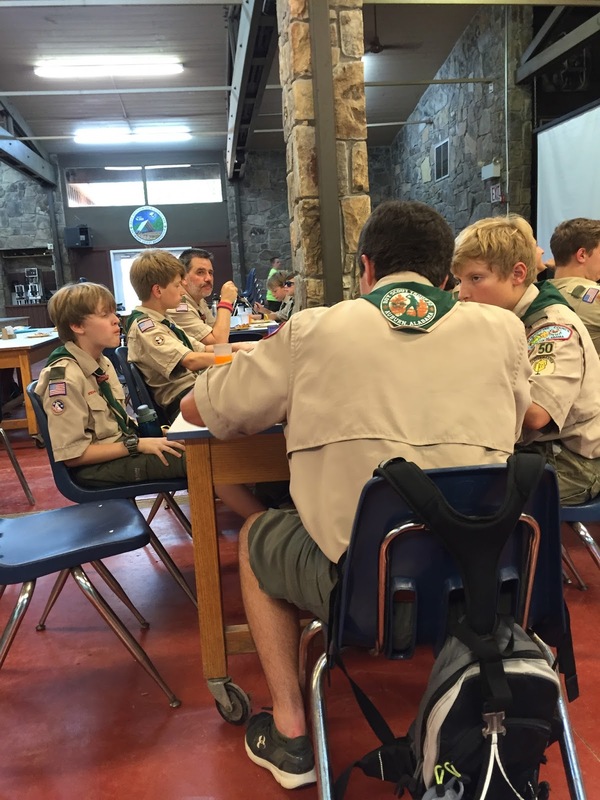 At other camps, these tests have been given by lifeguards watching over multiple scouts at a time. We were dismayed to see that the Skymont waterfront staff was giving the test to scouts one at a time. Given the numerous scouts waiting to take their test, we questioned the waterfront director as to the efficiency of such a system. She responded that this was a BSA rule that required one lifeguard per scout when giving the swimmers test. If so, this was a rule none of us had ever encountered. We offered to provide her one of our assistant scoutmasters, who happens to a BSA lifeguard, to help speed up the process. She considered the idea for several seconds before agreeing to allow it but only if he passed the swim test first! All of our scouts (and even the adults) successfully passed the test and were classified as swimmers. However, it took three times longer than in past summers. Waiting in line for the swim test. Assistant Scoutmaster Davis Baird assists the staff in giving swim tests. Following our afternoon swim, we returned to the campsite to unpack our gear and set up our area. Dining flies were set up in each patrol area and lanterns were assembled next to the picnic tables. At 5:30, we headed to dinner, which for tonight was served as a buffet. The food consisted of a pasta dish with rolls, salad, and chocolate pudding for dessert. Some of the scouts made multiple trips through the buffet line in an effort to satisfy their hunger, although one scout was spotted with only rolls and pudding on his plate. 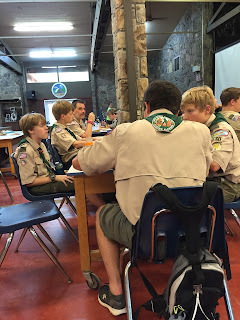 The scouts work on consuming as much as they can. More photos from the day are found in our online photo gallery.